We are delighted to announce the opening of our competition winning Pavilion at the MuseumGardens of the V&A Musuem of childhood. 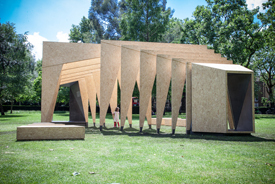 The pavilion will be open to the publicduring the London Festival of Architecture in June 2014. The tranquil gardens of the museum can be a place to temporarily escape from the demands of reality. The Dream Pavilion at the heart of MuseumGardens is an idyllic place to allow thoughts, images and collected impressions of the city to unfold within this peaceful interactive public space. Our response to this is two main forms that gradually open out and increase towards the centre from human scale volumes at each end. This allows people to meander through and explore as the openings increase and frame views to the garden and city beyond. It’s a heavenly contemporary structure creating a space with a sense of tranquillity, beauty and mysteriousness. The Dream Pavilion’s informal entrances are directed towards the axis of the main site access routes providing a visual focus when entering the site. There can be a fine line between a dream and reality and the perception of the pavilion constantly shifts from solidity to transparency depending on the vantage point. The form of the pavilion also creates inspiring and ever-changing shadows according to the movement of the sun. The pavilion aims to provoke discussions about architectural aspirations and creativity through exploring geometries to create inspiring spatial forms. Although there is a prescribed circulation route through the pavilion, thresholds between inside and outside are blurred and participants can weave through the spaces towards the perimeter seats for further reflection. The materials and fabrication method are based upon simplicity and sustainability using diagonally cut orientated strand board panels. Each frame comprises of a structurally efficient diagonally cut OSB panel to form the vertical elements with a further diagonally cut sheet forming the horizontal cross brace. This configuration ensures no material waste. The three elements are connected to form a structure frame, and each frame is spaced apart with horizontal ties which vary in length according to the space between each frame. Galvanised base shoes proved stability where the frame connects to the ground.